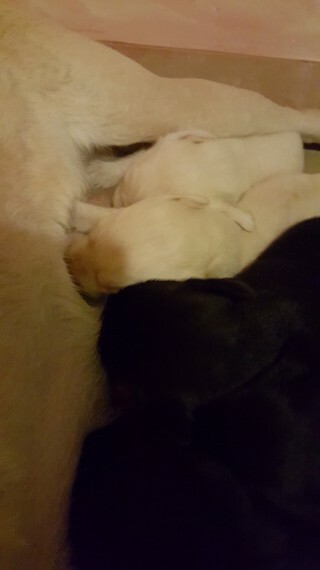 Beautiful litter of Labrador Retrievers Mixed colours only 1 pup left 1 Golden Female 750 Both parents are our pets. Female is white KC reg Chesslope Good blood line Swinemoore gundogs Father is black drakes head not Kc reg awesome dogs. great with kids. Will be 1st vaccinated and wormed . flead and micro chipped with puppy pack on collection. Ready Friday 25th May Pups are in excellent home enviroment and are being well looked after by all of us. Mother is kc but not father So cannot be Kc Reg . Thanks for looking. Last one..